As I mentioned before, I found myself needing some last minute, but meaningful Christmas ornaments for the kids this year. Firecrackers big accomplishment over the last year has been learning to read, so I thought I would make her a book ornament. I got this one done quickly and in one sitting while Hubby took the kids to the park. I used a sewing machine, but you could easily do it all by hand. 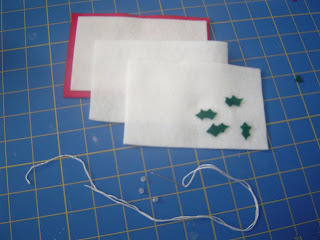 Materials: Red and white felt (one sheet of each should be enough, but you might need two sheets of white depending on how many pages you want. ), scraps, embroidery thread, beads or other trim for decorations, needle. 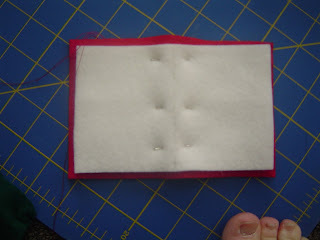 I cut one rectangle out of red felt, and three out of white felt. The red rectangle here is 4 inches by 6 inches, so the finished book is 3x4 inches. 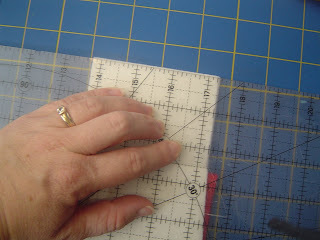 The white felt is 3 1/2 inches by 5 1/2 inches, so they're just a bit smaller. 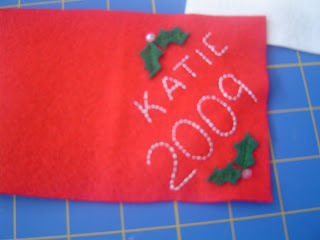 I cut some green felt scraps in the shape of holly leaves and used some beads I had on hand. I layed things out on the cover and wrote Firecracker's name and the year in pencil. Then I went over it with white embroidery thread. You could do this step with a paint pen or fabric marker, but I didn't have those on hand. Don't worry about what the back looks like because it will be covered up. I sewed the leaves on by hand with just a stitch down the middle and ended up really liking the effect. I'd also planned on using more beads, but liked how it looked with one. If you want to cover up the back of your stitching take one of the pieces of white felt and center it on the back of your cover. Sew around all four edges to secure it, being careful of the beads. This is like the "paste down" of a real book. (Thanks to my bookbinding sister Kendra for teaching me about those.) Sorry I forgot to take a picture of this step. To add pages to your book, pin the other pages to the cover down the middle and sew using a sewing machine or you could do this by hand. Then I trimmed those inside pages just a bit, so they weren't sticking out beyond the cover. 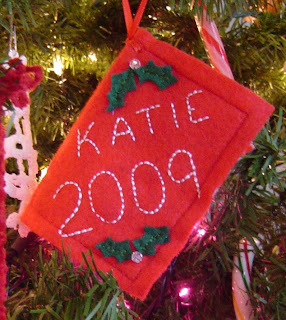 Then to finish things up all you need to do is attach the ribbon to hang it on the tree. Nice work, Polly. I like this ornament. PS - Are those your toes in that one photo? ?